Tonight marks our Zamily’s last night in Zambezi. It is bitter sweet to be leaving this place that, for many of us, has only just begun to feel like home and these people who have just begun to feel like family. Our experience in Zambia has been filled with questioning and wrestling about our own cultural, emotional, and spiritual identities. We have posed many complex questions to one another in the midst of such a rich experience, many of which have no explicit answer. I am sure that I will still be struggling to understand my thoughts in response to these questions in the coming weeks, months, and even years. One frightening question that we must all be prepared to respond to in exactly one week is “How was Africa?” We owe it to our eager family and friends to provide some sort of insight into the whirlwind of a month that we have just experienced. How in the world are we going to adequately describe all that we have seen, heard, felt, and smelled in the past month while honoring the people and the place that have allowed us a glimpse into their lives? No words that I can provide during 5 minutes in passing or even an hour sitting in a quaint coffee shop will ever fully capture the many facets of my experience here in Zambia. While reflecting on my joys, failures, frustrations, and relationships, my mind has often come back to Howard Thurman’s quote“Don’t ask what the world needs. Ask what makes you come alive, and go do it. Because what the world needsis people who have come alive.” The experiences that have made a mark on my heart and will continue to impact my thoughts and actions are those experiences which have struck something inside of me that make me feel alive, more fully human, and more in tune with who God created me to be. Attempting to touch the surface of these experiences and how I believe I have seen the face of God through them is the only way that I can do justice to what I have experienced. Many of the moments that have struck a cord in me are moments that have made my soul ache and my heart heavy. Talking about these experiences and how they have transformed my worldview is absolutely necessary, but each one of us must be intentional about representing the whole truth, rather than just those parts of the truth that reinforce the world’s inadequate perception of what Africa is. As the wise and respected Raymond Reyes said during last night’s reflection, “you are responsible for what you know.” I have felt this more and more as I have been here. Not only have I been blessed with a bounty of knowledge through my education, but I have been given first-hand knowledge of the needs that exist here and around the world. My responsibility to share knowledge is two-fold. It is my responsibility to articulate the ways that I have been inspired in this place so that my family and friends may in turn feel a tug and a challenge for their own lives. It is also my responsibility to not allow the teaching and serving to end as we board the plane on the way back home. I now know that what may seem like simple and insufficient knowledge on my part can in fact empower entire communities. During one of our first weeks, the health team made an appearance in the rural village of Chavuma. Expecting to teach a simple lesson on nutrition to a small group of 20-30 women, I was overcome by amazement as the numbers grew to upwards of 200. By the middle of our presentation, our message was landing on the eager ears of half the village, including men, women, children, and village elders. “This is going to change our lives” has been a response to our teaching on a few occasions. Knowledge is power. So what are we going to do with this power? I feel a sense of duty and responsibility to offer every ounce of energy and knowledge that I have in order to help meet some of the needs that I have observed. When people ask me why I chose to pursue nursing as a career, I am often not quite sure of my reasoning. Through the past few weeks, I believe that God has revealed to me why I was called to nursing. The ability to share knowledge about health is an absolute gift and the practical skillset that nursing provides me with will openmany doors for me. I pray that I will be open to discerning the places where God is calling me and that I will have the courage to act. Our health team had the opportunity of meeting Tanis, a missionary nurse from Canada who works at the Chitokoloki Mission Hospital. 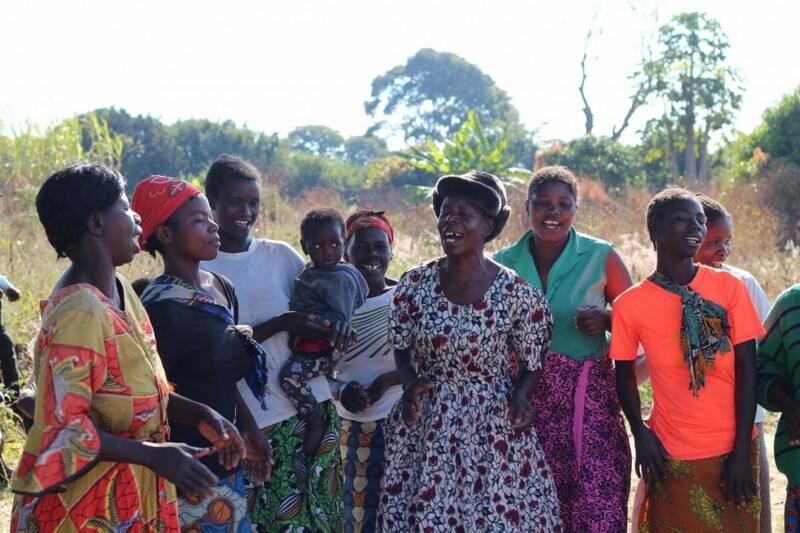 At the age of 23, Tanis felt that God was calling her to Zambia. Without hesitation, she listened. For the past eighteen years, she has continued to have faith in God’s plan for her life and has endured the struggle of being called in for surgery at three o’clock in the morning, only to work a full shift the next day. She persists with limited resources and technology, and endures with strength despite the disheartening experience of watching countless patients die of preventable disease. Rather than seeing her service as a sacrifice and burden, it is clear that she views her situation as a blessing. She is thankful to be able to use her skills, her heart, and her energy to be able to serve. I wish that every person reading this blog could have a chance to listen to her speak, for her sense of purpose and her confidence are remarkable. I cannot help but imagine myself in two years, as a 21 year-old who has just graduated from nursing school. If I felt called to do something so bold and challenging, I hope that I would be willing to make sacrifices for the sake of coming alive and living into my purpose on this earth. So, family and friends, brace yourselves. When you ask me “How was Africa?” I am not going to give you a neat and tidy synopsis. My explanation is going to be messy, long-winded, and, at times, poorly articulated. But I will do my best to honor this amazing experience and the people who have touched my life, whether it takes two minutes or two hours. Mom, Dad, Andrew, and friends- I cannot wait to tell you all about it! I miss you all dearly and am thankful for all of your support in helping me get here. Love you all to the moon and back. 12 Responses to How was Africa? The question of “How was Africa?” Still comes up frequently in my life. Whenever I talk about my experience there I feel a flood of emotions come back and never know where to begin or how to end. I still feel I have not articulated every detail to my family and friends. There are times even now that I think of something I have not shared with others. Africa is an amazing place with lots of heart ache, happiness, hope and love. After your time there you will never lose it, it is a part of you. I graduated from Gonzaga’s nursing program in 2011 and have enjoyed my journey as a nurse. I found my passion for health education in Zambia and truly feel blessed to fully understand the power of knowledge. You have also been touched by Tanis. I think about her all the time and how her story touched me. She is one amazing women that you wish everyone could meet. Enjoy your last couple hours in Zambezi, enjoy your next week exploring Africa (Victoria Falls, Safari etc.) and enjoy reliving your time when you come back. If I have one thing to say…it’s that I couldn’t be more proud to be a Zag alum, reading all the blogs last year I was so touched by each of the students ability to describe their experiences that I was ready to jump on a plane and join the group…and really scared my husband as he was sure I was seriously going to pursue adopting one of those beautiful little babies from Zambezi;) He must’ve told me a dozen times “it’s just not that simple Lynda”…:( Now this year I said my favorite summer reads had begun, and after reading all the blogs so far (which I’ve really enjoyed, but figured I wouldn’t bore you all with my comments everyday), I’m truly convinced that this experience somehow turns you all into award winning authors! After reading Matt’s blog a week ago I was so touched that I booked 2 tickets for my 12 year old and I to journey to that side of the world…an island off the coast of South Africa….Ill be there for a month in July and although I wish I was going to Zambezi…I know the experience will be eye opening for Wendy and I 😉 Maybe one day in the future…I’ll convince Josh I could come as the groups personal photographer 😉 Thank you all for the beautiful insights to your adventure. I have quietly giggled at how much Kaitlyn hit refresh every morning waiting for the latest blog, how she wanted to see Picts of the group, and how she would sit at the computer smiling as she read each of the days blogs. If they were late in being posted she would ask “why do you think they haven’t blogged yet?” Haha she got a small dose of what I went through last year. ;)Please could someone hug Mama Kawatu from me and tell her from one mother to another clearly she was gifted with a heart of gold and I’m so grateful for the care and love she gives all of you. Josh thank you again for providing this opportunity to the students! Conner…happy belated 21st (been waiting patiently and excited for your blog!) Mark….I’m sure the Zambezi “football” players are going to miss you on the field! And to each of you…congratulations on a beautiful job sharing your trip with everyone at home! Enjoy the safari and safe travels home! ZAMILY!!! First off let me say that all of your posts have blown me away. In many ways I challenged myself to let you all experience the beautiful Zambezi over the past few weeks without a comment because we all know how preachy I can get. And all of a sudden the time in Zambezi is coming to its end, therefore time for me to offer some words and thoughts particularly relating to the challenge of having to leave Zambezi, a place that has welcomed and touched all of you. In offering some words of wisdom, if you can call them that, I’d like to emphasize what Reymond said. Having the opportunity to travel to Zambezi is a great privilege all of you have experienced. And with such a great privilege comes great responsibility. It is your responsibility to recreate how beautiful Zambezi and all our friends there truly are. I remember as returned to the states I was challenged not only by the overwhelming reverse culture shock, but also by my expectations of my family and friends to understand “what Africa was like.” Although it may sound like an obvious fact, I urge you to keep this in mind; they (family and friends) did not go to Zambezi, YOU did. Silly right? But this simple clear fact was something that I didn’t fully comprehend. Your trip to Zambezi did not start after finals, but rather on the first day of class in January. As you all read Staying for Tea and reflected in class your journey had already begun. It is the FULL experience that you should convey to others when they ask about your trip. In order to more adequately share what your days were like teaching, having dinner at your home-stays, or walking through the market (with those small packages of ground nuts or the freshly backed scones) you also have to teach people about accompaniment and the power of stories. Without understanding the integral values the program is founded on, misconceptions of our beloved Zambezi will continue to exist. It is our responsibility to break down these misconceptions and ignorances people have about our time in Zambezi and what it means for us GU students and for the people in Zambezi. It is our responsibility to continue to learn and grow in the ways Zambezi and all our brothers and sisters there have taught us, wether that be to smile and laugh without hesitation, dance like crazy shakin those zambian hips, or share with others our deepest sorrows and challenges. Accompaniment is not a value or way of living only in third world countries or during times abroad, it is a way of viewing others as people where ever you are. It is our responsibility to spread this way of thinking and living, it is on you to spread the love that you felt there. Soak in those last moments in the convent, walking down those sandy roads, holding five hands in each of yours, the Zambian sun, and all your beautiful friends. Although you must leave now, you will always be with them, and they with you. I wish you all the very best as you continue on your trip. Continue to enjoy each other and look forward to the many great adventures yet to be had. I believe in and love each of you. As you return to the states and need an escape to talk about your transition back to the states don’t hesitate to contact me. Shout of to my man HOUSE! The Zamily was so lucky to have you. Happy late birthday bud, hope you got that celebratory Mosi all over the dome hahaha gotta love Zambian tradition. Dr. J!!! You killed it with another great group. Been missing you and all my Zambian brothers and sisters like crazy. I wish so badly I was there with you all. Thank you for leading such an inspirational and important journey in my life. Keep up all your good work. I have been overwhelmed and moved by all of your blogs. I am certain Shannon will have many more amazing reflections on her trip to Zambia. I look forward to seeing her soon. I am very proud of all of you. You reflect very well on Gonzaga. Wow, Thank you Hannah for that beautiful post. “How was Africa?” is one of those questions I dreaded but it also made my heart skip a beat with excitement. There is so much wisdom in what Raymond and Mateo just said, you went to Africa and even after hours and hours of explanation to friends and family, you still will be the one who went. I encourage you to remember the pain and struggles along with joy and laughter. After a year away from Zambezi, your blogs have transported me back. But let me tell you the positive times are easier for me to remember than the struggles, so on that three 3-hour flight to Livingston, I just encourage you to right down the heartbreaks, struggles, and humbling moments you found in Zambezi and tattoo those onto your heart. Those are the things you will ignite your spirit a year later, reading the next set of bloggers! My loves, you did it. After months of preparation, readings, trips to REI, and nerves your stay in Zambezi is coming to a close. Like Mateo was saying, take one last walk around those sandy streets, letting a couple little hands fall into yours as you go. Breath in the air and see your last Zambezi sunset. These are also images and smells that will become a part of your soul once you leave. I received a letter in the mail today from my little Zambian brother today from Simako. If you see him before you leave will you let him know I recieved it and it made me cry so many tears of joy. Conner if you see him give him a BIG hug for me, because you give great hugs! And the next time I hug you it will be like hugging him. Thank you for whoever helped Simako find my address or helped him send that letter. It is hanging above my bed in hopes that I will play and dance with him in my dreams tonight. Mark, thank you for the honesty in your post. The struggle and wresting feeling that Lucy and Katie talked about in their comments to you will stick with you. There is a true beauty in that struggle and as more and more people become aware of the damage of giving handouts without a real connection or friendship, hopefully we can change our actions both in our travels and back in the US. I am so excited for your return Mark, I can’t wait to see that billion dollar smile of your and sit you down and make you tell me EVERYTHING. I bet you have never had so many people want to play soccer with you! And I am sure you are loving that. Celia, WOW! Your words blow me away, I read your post all in your voice in my head as if I was sitting on the floor in that little supply closet where we kept Josh’s laptop as you read it to me yourself. Your words are beautiful and SO SO true. The most beautiful thing your entire group has given the community is to having just been there with and among the people. Having those real conversations, sharing a smile, clapping along to the beautiful sounds in church. Look how many gifts have been exchanged during your stay and those things are invaluable. Celia, I remember sitting in my room before you left and I just kept thinking “I can’t wait for her to experience it.” Counting the days, until we can lay on my bed laugh, cry, get fired up, and smile about our experiences. Missing your warmth and I know you that you are sharing that same warmth with your Zamfam and the people you encounter. Conner, I am really missing you Conner. I hope there have been no spider encounters over in Zambia, because the C.L.A.M.M.S aren’t there to protect. I wish you the happiest of birthdays, sorry I couldn’t be there to leave you another surprise…. Josh, My applause goes out to you on leading this articulate, adventurous, and passionate group through another amazing year in Zambezi. Give Mama K, a big hug from me tomorrow before you leave, hopefully the Zambian pledge didn’t strike on your group this year and she didn’t have to deal with any projectile vomiting like she did with me last year. Tell her I still think about her always. I bet her children are growing so big!!! Thank-you for another meaningful reflection. Anxiously waiting to hear and see more pictures. Keeping you all in my prayers. On behalf of the House Family……Wow. We have been so touched by your daily reflections! You all have wisdom way beyond your years! Josh- As we were at our youngest son, Chad’s ASB banquet last evening- we were reminded of such great mentors, educators and inspiring leaders that have had such a positive influence on our boys, including you!! Thank you for your dedication to this marvelous program and thank you for keeping our “kids” safe. Conner- See you soon, son! We love you loads!! What an absolutely beautiful reflection, Hannah! Love that quote by Howard Thurman, too 🙂 Your reflections are so mature, and even though words may not feel sufficient to share your experience, you can rest assured that your heart for Africa comes through in such a true way– THAT is something people will understand. So proud to know you and this team. You are all studs. I just read your post twice. I’m sure I’ll be reading it a few more times; it is so beautifully written. I can’t believe how fast these past few weeks have gone by, yet so much has happened each and every day. Your blogs are a testament to that. Hannah, I absolutely loved the line where you say the experiences you’ve lived in Zambezi have struck something inside of you that make you feel alive, more fully human, and more in tune with who God created you to be. Throughout your time in Zambia, you all have seen raw beauty, felt deep joy and sorrows, and lived pure love. You’ve transcended a form of living that is often confused by comfort. As you return home, you might experience some reverse culture shock. Don’t be too harsh on yourself or on your culture; although it might seem difficult at times, continue to be as receptive to the beauty of the world that is present anywhere you go, even though it might seem hard to find at times. Not everyone will understand what you’re feeling and thinking, but you guys have lived something very special as a group and you’ve got each other as a support group, as well as everyone else in the extended ZamFam! Josh!!!! This trip continues to have an incredible impact on people’s lives and it certainly wouldn’t be possible without you. Thank you for being awesome. Okay, I admit it– I’m starting to miss seeing you at the office all the time. Zambia Gold studs: I just want to hug you guys. So proud of you. Your words and reflections from your Zambia experience so clearly tell of your generous spirit and your gratitude for all of life. I can only believe that those two gifts have served you well in Africa and have allowed you to fully feel the experience. Your family is so proud of you for accepting this opportunity as a gift to receive, as well as to be given away. You are in our daily thoughts and prayers. Can’t wait to see you in a week! I’m an American who lives here in Zambia, i am the GM of one of the hotels in Livingstone, but iIalso run basketball programs at the high school level as well as the ZBA level as I am the Southern Province Chairman for the Zambia Basketball Asssociation. Currently funding for sports especially basketball is almost non-existent and conversely the talent level and dedication of some of this kids is immense. This is the first I have heard if Ganzaga students traveling to Zambia, and I have a humble request. The next time any Gonzaga students travel to Zambia, if you have any used sneakers, basketballs, jump ropes, or anything of that nature that you’d like to donate and bring with you on your journey, please contact me robert@redchemistry.com my name is Robert McCarron and anything at all even the smallest gesture would be hugely appreciated. Thank you for your time.